staggered in order to prevent the launch vehicle sustaining a single jarring ignition transient. First to be commanded was the centre engine, followed at quarter-second intervals by diagonally opposed pairs of engines. Each engine then went though an elaborate sequence that was carefully choreographed to minimise rough starting, with all engines having reached full thrust by T-l second. A description of the astonishing F-l engine is necessary before going through its ignition sequence. The most prominent component of the engine was the bell or nozzle, usually seen with an extension added to improve its performance. This tapered to the throat and a cylindrical space, not quite a metre across, called the combustion chamber. At the far end of the chamber was a thick steel injector plate with hundreds of slightly angled holes like a giant shower head. Alternate rings of these holes sprayed jets of fuel or oxidiser that impinged and burned together. The walls of the chamber and nozzle were constructed of piping through which the kerosene fuel was circulated to cool the chamber walls prior to being sprayed through the injector plate. It was not enough for the fuel and oxidiser to flow from the tanks and directly enter the engine, as the huge internal pressures of the F-l would have forced the propellants back through the holes in the injector plate. 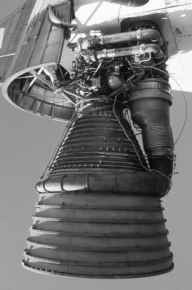 Each engine, therefore, had its own dual high-pressure pump arrangement to force the propellants into the combustion chamber. This dual turbopump was mounted to the side of the combustion chamber and driven by the burning of some of the propellants. In an action somewhat similar to that in a jet engine, the hot gases from this combustion forced a turbine to spin a shaft which drove the pumps. 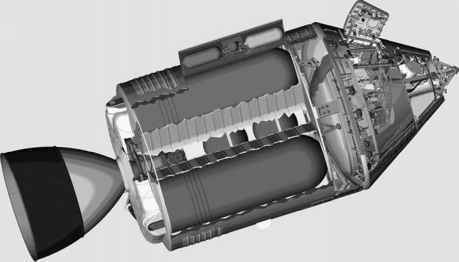 The final task for the turbopump's exhaust gases was to be expelled around the end of the engine bell, but above the nozzle extension via a large wrap-around manifold. Although the turbopump exhaust was hot, it protected the nozzle extension from the much hotter gases coming from the chamber. Four pipes, two each for fuel and LOX, led from the pumps to the injector via valves that controlled the engine. The F-l engine. On the right is the turbopump whose wraparound exhaust fed into the bell. rose, bursting a cartridge of hypergolic fluid and injecting its contents into the chamber followed by fuel. 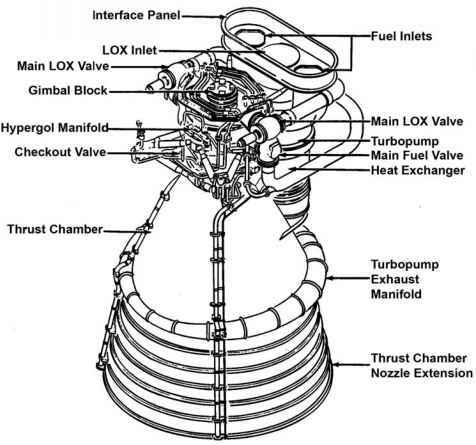 Engine start-up was ensured by the spontaneous ignition of the hypergolic fluid with the LOX already in the bell. Diagram of the F-l engine. 1 Hypergolics are a family of chemicals that ignite spontaneously when mixed. 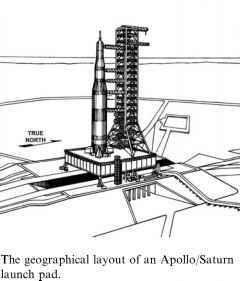 two tonnes of LOX - 15 tonnes altogether - as the vehicle sat at full power, waiting for the confirmatory signal that all five engines had achieved full thrust and the Saturn V could be released.